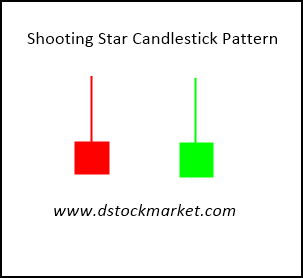 The shooting star candlestick pattern is a bearish reversal signal that often appear at the end of a bull run. This candlestick pattern is very easy to spot because there will be a small body with a long tail on the top. When you see this pattern appear after an extended bull run you need to beware and expect a bearish reversal. The above diagram shows the construction of the shooting star. The candlestick pattern will have a small body. The body can either be red for a down day or a green for an up day. It does not matter. But the important thing to have is a long tail at the top of the body. The psychology behind this pattern is very simple. At the start of the day, buyers came in and push the stock higher. There was excitement and market participants thought that the stock was going higher. However by the end of the day, the stock could not maintain its bullish momentum. It dropped significantly from the high and ended lower thus forming a bearish shooting star candlestick. 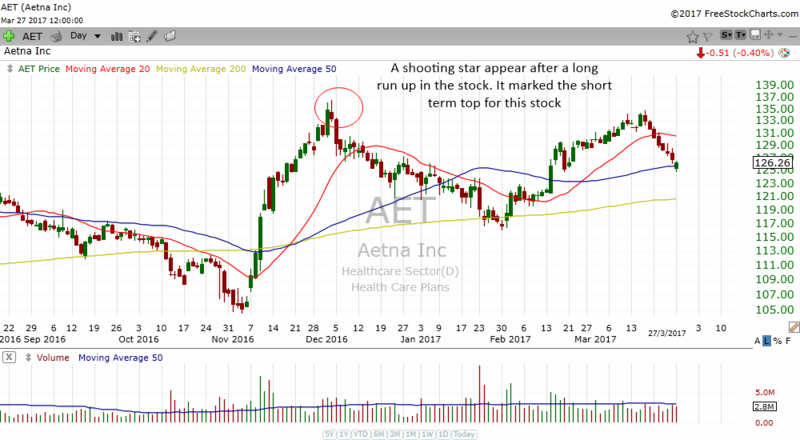 In the chart above, AET had a nice bullish run in November. 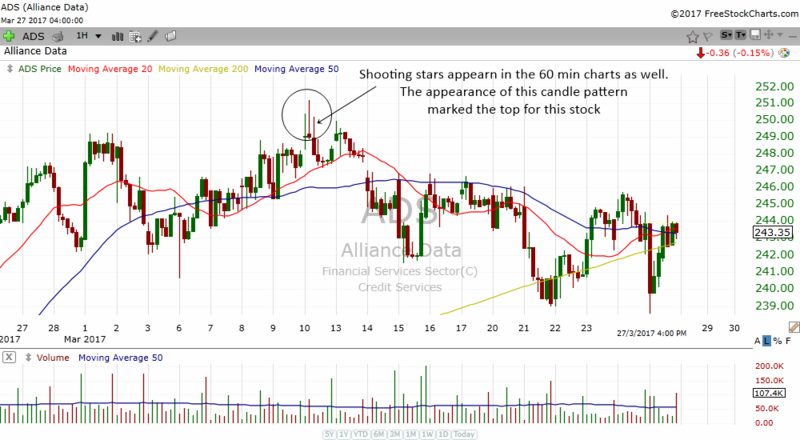 In early December, the stock made a shooting star candlestick pattern which marked the short term top for this stock. A stock that has a shooting star after a period of run up can be expected to have a short term reversal. Therefore, those who are holding the stock should be careful. The shooting star pattern does not only appear in daily charts. They appear in all kinds of time frame. The chart above shows the 60 min chart of ADS. After a brief run up, the stock formed a shooting star in the 60 min charts. The appearance of this candlestick pattern hinted of a reversal and sure it did reverse. The stock eventually gap down and moved lower. That's how powerful the shooting star candlestick pattern can be. A shooting star that appears after a stock gaps up and have a nice run can often signal a short term top. Doesn't mean a stock will fall everytime a shooting star appear but when you see a shooting star appear after a nice run, you should consider very well whether you should take some profits off the table. 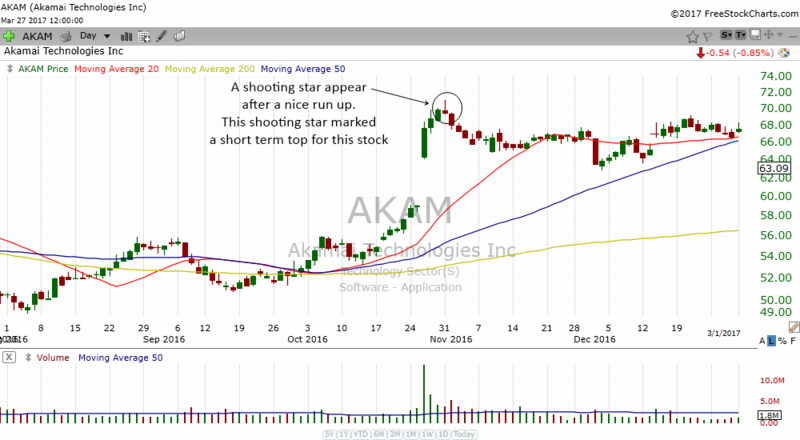 In the chart of AKAM above, the stock had a nice run up, gap and then run higher till a shooting star appeared. The shooting star hinted of a short term top for the stock which gave traders an early warning to take profits off the table. Shooting stars also work very well in the weekly charts. In the chart of AN above, the stock had a nice run up to price resistance and hit the weekly 200 MA resistance. 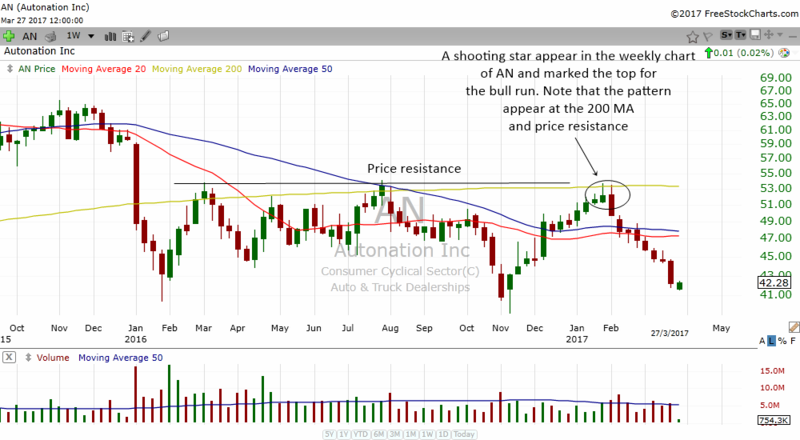 The shooting star that appear at price resistance and MA resistance gives a powerful signal to the trader that something is about to happen to this stock. The stock eventually declined and started a new downtrend in the daily charts. Knowing how to combine candlestick patterns with multiple time frame analysis and other indicators can often give the trader an edge in the markets. Last of all, candlestick patterns can even appear in very long term charts like the monthly charts. 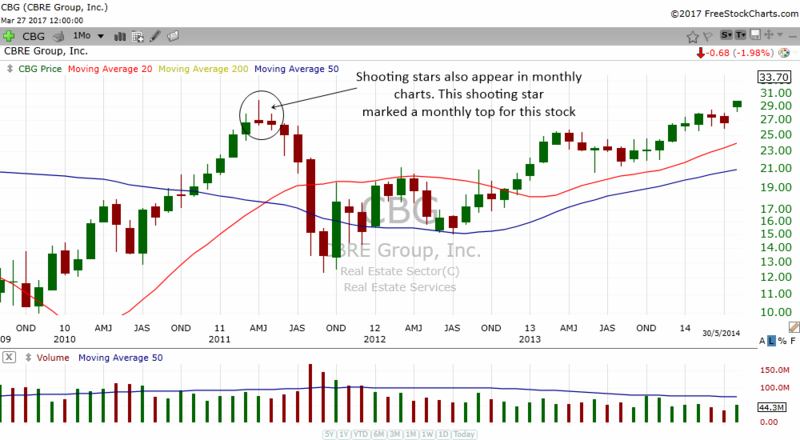 Notice a shooting star that appear in the monthly chart of CBG? The stock had a really nice bull run for months and then a shooting star appeared. The next bar, a doji appeared. What did this tell us? It tells us that upward bullish momentum is slowing down. True enough, the stock started to decline and ended up with a quick crash for a few months.